In several of my blogs, I have mentioned my friend Barb Stayton as my inspiration for fundraising for the Leukemia and Lymphoma Society. 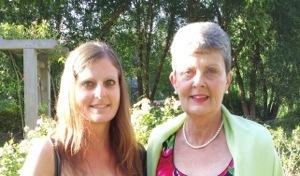 Here is a photo of Barb and her daughter, a lymphoma survivor, and an article which appeared last spring in the Indiana chapter’s newsletter. Barb fought a tremendously difficult battle. She suffered severe pain before the diagnosis while trying to support her daughter during her chemo treatments. Then Barb had a rough time during her chemo treatments, Barb was stricken with a heart attack, liver failure and damage to her retinas that left her legally blind. Through it all, she remained positive, hopeful and never gave up. LLS is the largest voluntary cancer research agency specifically focused on finding cures and better treatments for blood cancer patients such as Barb and her daughter. With the scope and scale to fund many projects at the same time, LLS supports hundreds of cancer scientists around the world. Giving back is an understatement! Barb has been an active volunteer and donor since 2004. She has served on several committees, joined the board in 2008, was Woman of the Year in 2009 and is currently serving as president of the Indiana Chapter. She is truly a life-long LLS advocate. And her financial commitments remain strong now as well as in the future as she and her husband have made a commitment to LLS in their will. For every dollar invested in LLS, 78% supports the mission of LLS. Research is funded through donations from people like Barb. Many scientists, clinicians and clinical trial participants have developed and improved current standards of care over time. It takes about eight years to develop a successful new drug. What a wonderful story of love, determination and unselfishness. Unfortunately, my dear (almost my son) Danny didn’t survive his AML. He battled bravely for 2 years and 10 months, then died at 2 months after he turned 21 in 2009. Though it’s too late for Danny, here’s hoping the research continues so treatments become more effective for everyone. Thank you for your contribution. I am guessing you might be a recent anonymous donor to LLS. Thank you very much. I am sorry that you lost Danny in 2009. The continuing research is so important.